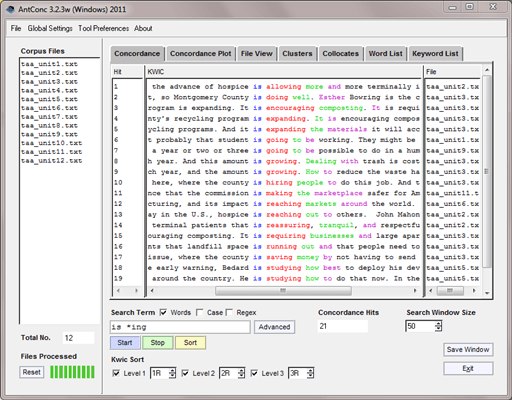 AntConc is a freeware, multiplatform tool for carrying out corpus linguistics research and data‐driven learning. It runs on any computer running Microsoft Windows (tested on Win 98/Me/2000/NT, XP, Vista, Win 7) Macintosh OS X (tested on 10.4.x, 10.5.x, 10.6.x), and Linux (tested on Ubuntu 10). It is developed in Perl using ActiveState’s PerlApp compiler to generate executables for the different operating systems. This entry was posted in AntConc, Tools on December 23, 2013 by Markus Killer.